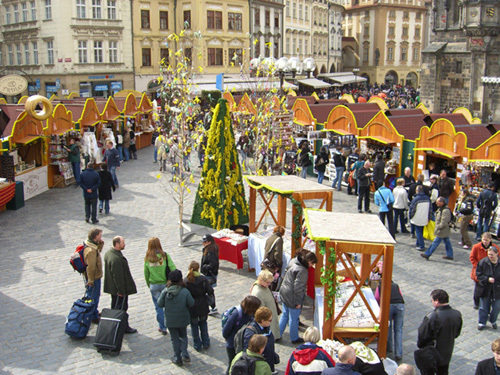 An Easter market set up in Prague's Old Town Square. Old Town Square is one of PPS' Great Public Spaces. How would PPS' approach to public spaces apply to a country emerging from 50 years of communism? This was the challenge that set the stage for PPS' first international effort. From 1994 to 1996, with support of the Rockefeller Brothers Fund (RBF) and the German Marshall Fund, Project for Public Spaces directed a series of demonstration projects in eight towns and a major historic redevelopment project in Brno. Under this program, non governmental organizations in the towns received technical help to develop ideas from the community for improving public spaces, and were awarded small grants to fund a project manager and implementation of small scale demonstration projects. The program was complemented by extensive training workshops for local participants and outreach to NGO and government leaders. The overall result showed the potential of PPS' participatory, place-based approach in restoring a sense of community place to these historic communities. In 1996, the program was taken over by the Czech Environmental Partnership Foundation in Brno, now the second largest foundation in the Czech Republic, and became the Partnership for Public Spaces (Patnerstvi pro verejna prostranstvi or PVP). The Partnership has built on the original PPS demonstration projects, and continues to fund and support projects that engage citizens in the decision making process and assist specific projects aimed at the improvement of public spaces in cities and towns. Ten years later, the PVP's capacity to do Placemaking and lead public participation workshops has expanded enormously. Under a recent grant from RBF, PPS worked with the Czech Environmental Partnership to train 25 community and NGO leaders around the country in its approach to public space revitalization so that they can facilitate community participation processes in small towns and villages. The Czech Partnership has also launched a new subsidiary organization to provide technical assistance to communities seeking to make more sustainable communities, based on PPS' model. Today, the Partnership collaborates with PPS in its international activities to share their skills and expertise to programs starting up in other post-communist nations.